The Olympics are so close now, I can't stand it! I thought I'd offer this handy dandy primer for the not-so-gymnastically-inclined as a preview of who to look for as we head to London. The gymnasts selected for the Olympic team--Gabby Douglas, Jordyn Wieber, McKayla Maroney, Aly Raisman, Kyla Ross, and alternates Sarah Finnegan, Anna Li, and Elizabeth Price--are no big surprise. What IS surprising is the defeat of Wieber by Douglas at the Olympic trials. Very interesting! Still, Wieber's probably going to win the whole darn thing. She's coming in as World Champion and she's a rock solid all-arounder with high difficulty, more powerful than balletic, not unlike Shawn Johnson and Carly Patterson before her. Douglas hasn't shown the consistency, but she's peaking at the right time. She exudes personality and charisma, in that Mary Lou sort of way. Even if she doesn't beat Wieber, she could end up as the media darling (see: Nastia Liukin vs. Shawn Johnson). Here's what's interesting about McKayla Maroney: pretty much everyone in the sport of gymnastics agrees that she is the best vaulter in the world. 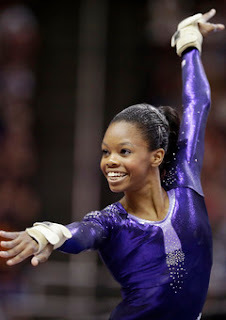 And yeah, she IS the reigning world champion on vault, but it's more than that. It's that every time you watch her vault, it's the best vault you've ever seen. Unfortunately she's not consistent on anything else--but when you make hardened old geezer coaches swoon with one skill, you earn your spot on the team. Aly Raisman is almost a great all-arounder, but for her weakness on bars. Her strength is her intricate and difficult tumbling--in particular, her opening pass, 1 1/2 twist through to double Arabian, front layout, makes her memorable, and that's really important when you're performing for judges who have seen it all. All gymnasts should be striving to make themselves memorable. Kyla Ross has been on everybody's radar for a while now as a junior. So she's the youngster of the bunch, but she's consistent and overall a very lovely gymnast. Factor in the Romanians, Chinese, and Russians--and the US is the team to beat.